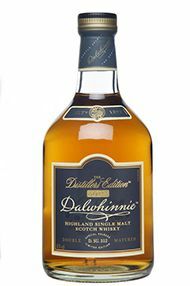 The Dalwhinnie distillery, currently owned by Diageo, was founded by James Buchanan and called Strathspey when it opened in 1897. 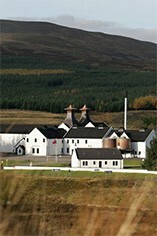 It is the highest distillery in Scotland, located midway between Perth and Inverness and situated at 326m/1073ft. It is in a glen with the Monadhlaith Mountains on the one side, the Forest of Atholl, the Cairngorms and the Grampians to the other. Dalwhinnie is Gaelic for meeting place and the village stands at the junction of old cattle-droving routes from the west and north down to the markets of Crieff and Falkirk in the Central Lowlands. James Buchanan became well known for his Buchanan and Black & White blends. Stretching a point the distillery can regard itself as being on Speyside, though it is 5 miles or more from the beginning of the dense distillery country to the north. Dalwhinnie was damaged by fire in 1934 and reopened in 1938. The distillery also serves as a meteorological observation point and every day the distillery manager treks, wades or slides across the lawn to the 'Stevenson Screen' to record the day's observations. Only 10% of the production is marketed as single malt, the remaining being used, among others, in the Black & White blends. 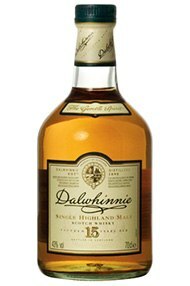 Famously, the highest distillery in Scotland, (in terms of altitude), Dalwhinnie is renowned for its liqueur-like and gentle, peated character. This expression has been given extra maturation in oloroso cask-wood, enhancing both richness and body.